So begins the first day on my Navarra Wine Adventure. After a bit of a blow out on the night we arrived, I found myself in my hotel bed thinking that perhaps I needed to nurse my drinks in order to survive the trip. Whenever a group of wine bloggers get together, things have the potential to get a bit fun. That realization caused me to get out of bed, while still remembering the events described below, and begin my first day in Navarra. The "#Navarra5" had a blast on Sunday night, visiting various tapas bars around Pamplona. In fact, tapas is not used by the natives of Navarra, they kept reminding me that the term was "pintxos", pronounced "pinchos". As those of you who speak Spanish know, a slight mis-pronunciation of that word could have dire consequences. Pintxos are single-serve bites, sort of like a large amuse bouche. They can be anything from a small roll with Jamon Iberico on it, freshly cooked eel, tortillas (not that kind), cheese and jamon bites in a crunchy shell, even smoked sardines. You go to the pintxos place and order a bunch of small plates, usually for about one Euro or so, wash it down with a glass or two of wine, then head out for dinner or to a show. I love this idea! The group's favorite restaurant/bar for pintxos quickly became El Gaucho, located only a half kilometer from our hotel, Palacio Guendulain, making it very conveinent. We ended up visiting El Gaucho multiple times throughout the trip, always in search of delicious pintxos, and of course, Navarra wine! Meeting downstairs in the overcast, cool light of a Navarran morning (September 19th), our van was quickly loaded with camera gear, bags, and wine bloggers. The first stop was 30 minutes away, at the headquarters for the D.O. 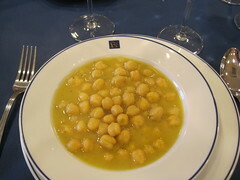 Navarra. Set in a beautiful postmodern building, this is where Navarran wine is administered. The facility also acts as a research station for Spanish viticulture. Thankfully there was coffee and water for us all, and we were introduced to the D.O. of Navarra via a slide show from the wonderfully enthusiastic Pilar García-Granero, who is the head of the administrative agency. Some of what was covered includes the history of the Kingdom of Navarra itself, Navarran grapegrowing, and an overview of some of the rules that wine from Navarra must adhere to. 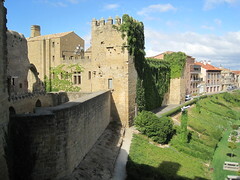 Given a proper sense of context, we were ready to explore the area, starting with the Castle at Olite, where we got a guided tour of the grounds. 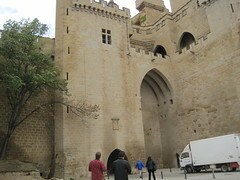 The pictures below make an effort to capture the beauty and sheer scale of Olite. To view more pictures of my trip to Olite, visit my Flickr photostream. With that tour complete and the #Navarra5 getting thirsty, it was time to visit a winery! Another 30 minute car ride brought us to Bodega Inurrieta, where we met Jose Antonia Pellicer and winemaker Kepa Sagastizabal who gave us a tour of the winery before leading a tasting of their wines. 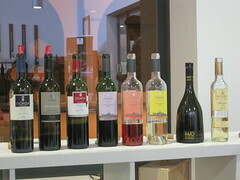 I've written about Inurrieta previously, one of their wines was in a Wines of Navarra Live Tasting and showed well. After tasting and discussing the wines, we were treated to a magnificent lunch, with the winery owner himself doing the cooking. Lasting a full two hours, we ate summer greens, piquillo peppers, chickpea soup, steak, and a dessert called cuajada, one of the most interesting things I've ever had. 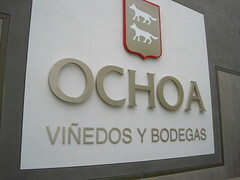 Stuffed with both food and information, the #Navarra5 journeyed to the next stop, Bodegas Ochoa. That name should ring a bell, I've written about their wines in my Dessert Wine blog post as well as the Wines of Navarra Live Tasting post. Talking to Beatriz Ochoa and Pablo Aguirre, I enjoyed their enthusiasm and passion for the bodega. It also didn't hurt that the wines were superb. We even got to talk (via translator) with the founder himself, Mr. Javier Ochoa Martínez. In the span of one day, I had visited two wineries producing deliciously accessible wines which are primed for the American market. Considering how we Millennials are growing more adventurous in our quest for good bottles, I really hope my generation starts asking for Navarra wine at our local wine shops. These kinds of wines, priced at around $7-$15, would sell like crazy one wine lovers tasted them. That is a fact. 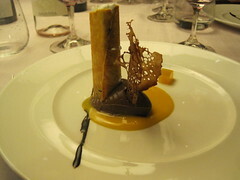 The food was amazing, one of the best meals I've had all year and each dish paired very nicely with the wines. Our host for dinner, Conchi Biurrun, picked wines from all over the region to showcase the versatility that is Navarra wine. After the meal the #Navarra5 headed back to our marvelous hotel for a much needed break, to rest our minds, bodies, and palates for the next day. 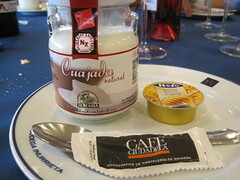 On our second day, September 20, we were to tour more wineries and take a walking tour of the city of Pamplona. That blog entry will be a lot of fun, and I promise some wonderful pictures are to come. My only question is...how do I get included on these blogger trips! Next year #Loire6???? P.S. Navarra Roses are killer! All I can say is wow... How do I get in on that gig next time? I can't believe this was ONE day! How fabulous. The food looks unbelievable. @ Courtney..I still don't know how I got invited! But I think the #Loire6 is a fantastic idea, we gotta get the Loire wine trade group to fly us over there! @ Mark..I think you just gotta blog incessantly, like I do. Even a mediocre writer can get picked, cause I did! @ Mary..pretty crazy right? Wait till I post the next blog entry. It gets better! Very nice, Beau. Sending some envy your way man. Sounds like great trip. I hope the Cali gang behaved. :) Cheers! 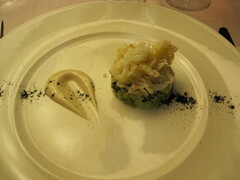 thank you very much for a very nice blog about our region!!! look forward to reading more about it! 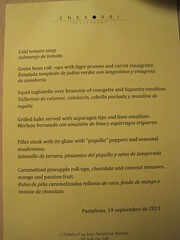 It has been a pleasure for Conchi Biurrun to have to oportunity to join you for dinner the first day. Saludos cordiales! Sounds like it was a fun & yummy trip!! @Monica Thanks for reading! 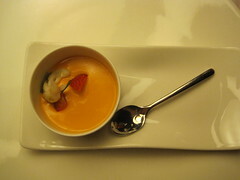 Glad you enjoyed it, stay tuned for the next blog entry soon! 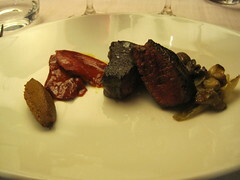 @Asociacion Bodegas I can only hope that more Americans start asking for Navarra wine. Everyone we met was was so friendly and gracious and I enjoyed having dinner with Conchi that first night, she is a superb resource for Navarra and the wines from the region. @Cindy Fun and yummy..yea..and I gained some weight too, now I gotta work it off and blogging sure isn't good exercise :-) Thanks for reading!